Looking for another racing experience on Switch? If so, Space Ribbon from Onteca may tickle your fancy. The racer is due out on Switch next week as a digital download. 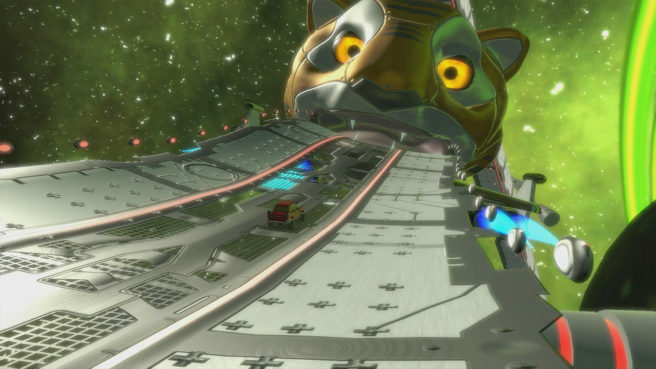 Taking place far into the future in a reality TV racing platform, Space Ribbon features track generation, multiplayer splitscreen, unlockable cars and upgrades, and more. We have more details and a trailer below. – Never the same track twice! – Intelligent track generation combines procedural AI with great track design. – Navigate a twisting, turning, unpredictable racetrack as it appears ahead of you. – Race your friends with up to 4 Player split-screen. – 2 classes of car, with 4 in each class, each with different strengths. – Level up your racer to unlock new and harder race modes including cosmic mode. – Unlock new cars and upgrades to improve engine, grip and slipstreaming. Space Ribbon is slated for August 24 at $14.99.